Earlier in the day, Telangana Congress Working President A Revanth Reddy, who had given a bandh call to protest against TRS chief K Chandrasekhar Rao's public meeting in Kodangal assembly constituency, was taken into preventive custody. 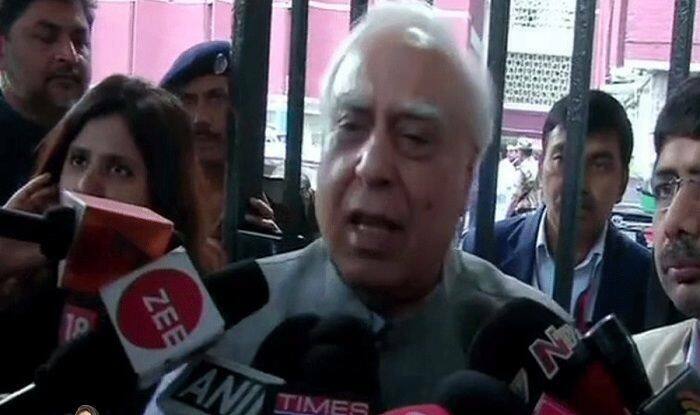 New Delhi: A delegation of Congress leaders led by Kapil Sibal and Madhya Pradesh unit chief Kamal Nath met the Election Commission officials in the national capital on Tuesday. According to a report, the leaders raised concerns over the security of EVMs during recently held Madhya Pradesh assembly elections on November 28. They also talked about dramatic midnight arrest of Congress’ Telangana unit chief. Accusing the BJP chief Amit Shah of misleading the voters by claiming that Congress party had promised free electricity to mosques and churches but not to temples in its elections manifesto, the grand old party demanded strict action against him. On December 2, while addressing a rally in poll bound Telangana, the BJP president had accused the Congress of ‘appeasing’ the minorities. Addressing the gathering, Shah claimed that Congress in its manifesto for the December 7 polls, had promised “free electricity” to mosques and churches but not to temples. “The Congress also speaks (in its manifesto) about reservations for the minorities in government contracts. It also talks about separate hospitals for the minorities. I want to ask (Congress president) Rahul Gandhi, what would be the fate of the poor people who do not belong to the minority communities,” he had said. “In case of Telangana, we have demanded Election Commission (EC) to send a notice to Amit Shah for giving false statements in Telangana which may trigger communal violence there,” Sibal added. Earlier in the day, Telangana Congress Working President A Revanth Reddy, who had given a bandh call to protest against TRS chief K Chandrasekhar Rao’s public meeting in Kodangal assembly constituency, was taken into preventive custody. “He (Revanth) has been taken into preventive custody in view of apprehension of disturbance of public order and breach of security,” Additional Director General of Police (Law and Order) Jitender told news agency PTI.